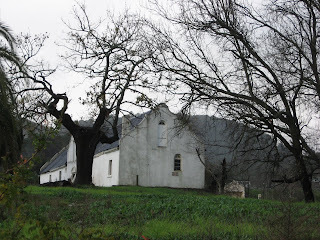 It has been a cold winter day in Stellenbosch two weeks ago, when our organisation met with Nella Paulse* (real name protected) and her father to help vacate the home she stayed in for the past seven years. She could not choose a worse day to tackle the move - the mud was thick and heavy and so the little rented 'bakkie' and trailer could not make it up the tracks. She and her family carried all of her belongings in the rain, and made eight small trips from the premises they occupied illegally for many years. "Can't I just come and get the matrasses tomorrow? ", she asked at some stage, "it will be soaked!". There was no more tomorrow for her at this place, so we all made a plan instead with borrowed plastic sheets. I could sense the collective emotion in the air, and the old barnyard (a popular and naughty student dance hall in my years at university) was filled with memories. It hung over all of us as the entire family helped to clear the space where the bar was still dark and prominent at the heart of the barn. I could physically feel the plastered farm walls calling out for repair - holding years of laughter and also many, many tears of hundreds of people crossing its doors. It is a sick building now - cold and huge. Not conducive for human occupation; let alone a family with children. But our Nella made it home for them all, with artifical flowers standing tall at a 'lay-buy' lounge set, and dim electricity fed from the local security hut to open light bulbs via a patched, snaking 'lead' across the wet grass. We fear for her young son to electrocute himself as he boldly disconnect their 'wires' to take it with them. "Rather leave it", I ventured, but Nella's brother interjected determinately "Hurry up, Nella won't leave without her stuff!" An old coal stove - probably more valuable than the home itself - belongs to her grandmother, she said. It worked for them, until recently. Made some 'pap' in it and it kept them warm. I took a picture and my mind spun back to our own home where my dad built such stove into our fireplace. We managed to broker a reasonable deal with Nella after a complete deadlock and legal cases between her and the developers. She drove a hard bargain. All parties are pleased and relieved that it is all finally over, before the dreaded date of the 'balju' and police ending on the door step to 'put them out on the street again'. No-one wanted that...luckily. It is one of very few happy endings to the extreme housing crisis here in South Africa - where we need more than 400 000 houses to cover a shortage in Cape Town area alone. This will not even stem the tide of homelessness, where the number grows with 16 000 per year as people migrate to the city for opportunities away from rural poverty. There are several innovative solutions to housing in South Africa, and communities are willing to contribute to their own future. Often, facilitation is needed. In the case of residents at the Doornbach informal settlement at Milnerton, Cape Town, the residents from form a housing scheme themselves and have already saved R41000 since September 2007. 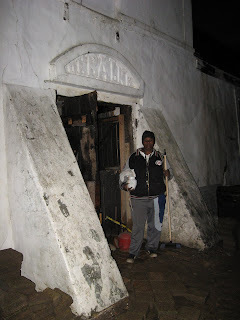 The experiences of residents to 'step out into muddy water when you get out of bed' are common during the floods of Cape Town and 'invading' a derelict brick house (like Nella) is certainly not an option. We need to understand that many informal settlements are erected in natural (winter) flood planes, and these conditions are inevitable unless more suitable land and resources are found. Property developers could (and should) play a role together with government to address the challenge. Why do so few people know about the housing crises that is escalating here in this beautiful part of Africa...? ?